Hotel Solitaire is rated 3.5 out of 5 by 19. Rated 5 out of 5 by meme2222 from I've made it through the 20th floor, Yippie This is an excellent variety of solitaire games. Very simple solitaire games like higher lower, match cards, match suits, score thirteen, and build up suit. If you play the demo, the first floor will be easy peasy. As you progress up the floors the timer gets shorter and, deck turnovers are less. This can make for some frustration to win the level but if you are persistent and quick at hand you can succeed. It may take umpteen times replay and gut wrenching nervousness to pass if you are not an arcade loving type person. I think most floors are passable with 3 or 4 tries except for the 20th floor which is downright aggravating. I stuck with it because I just had to open the terrace to see what that floor contained. Spoiler alert, it gives you Klondike and Free cell gameplays. The good things about this game is I like the way it is designed like a hotel. You get in the elevator and go to whichever floor you want to and play whatever solitaire game you prefer as many times as you want. You also will earn shuffles, undo's and other bonuses every time you play each room. So you can play the easy levels to earn the bonuses and use them to complete harder levels. I also like the games in the casino and rec room. They offer different variety of solitaire games like pyramid, golf solitaire and quite a few others. The 20 floors in the hotel will have a timer that you cannot turn off but in the rec room there is no timer. So if you can't complete the game fully, you should have the rec room open and can play all the games offered in the hotel there. Of course as you complete the hotel floors they will continue to open more games in both the rec room and casino. The casino has a timer but it is not so limited and I found it to be timed at a good pace. I do not recommend this game for anyone who has difficulty with time management games but if you can do those types of games like farm frenzy, you can do this. Please note, each room is pass or fail. Rated 5 out of 5 by baboop53 from Thank you! I played this years ago and am glad to see it on this website. Rated 5 out of 5 by bep1 from Good game I have had this game, but I like it very much. I keep coming back to it because it is a lot of fun. It is fun going to the different floors to play in different rooms. Rated 5 out of 5 by pennmom36 from There's A Solitaire Game Type For Everyone Hotel Solitaire has 15 different types of solitaire games to please every type of solitaire gamer. You can chose to visit each floor of the hotel and play solitaire in 5 different rooms, or you can choose Recreation to play solitaire at a relaxed untimed pace. 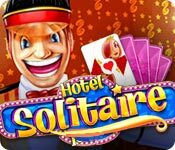 If you play the different levels however, it will unlock solitaire games in the Casino such as Pharaoh's Solitaire and Match 2 Solitaire. As you progress your way up the floors of the hotel, you can choose to play any room in any order, and you can replay the rooms as often as you want to achieve a better score. The following is a list of some of the main solitaire games available: 1) Facedown Cards: This is your typical game of Higher/Lower solitaire where you try to remove all cards from the board by placing cards either higher or lower than the cards shown on the deck. This game however has 3 cards shown on the deck versus the typical single card. 2) Match Pairs: This solitaire game requires you to make matches of the same number of card regardless of suit, again there are three deck cards shown at a time that can be used to make matches when there are no matches on the board itself. 3) Thirteen: This solitaire game requires you to remove cards that equal the number 13. The Ace is worth 1, the Jack worth 11, the Queen worth 12 and the King is worth 13 which means no other card is necessary when a King is involved. 4) Build Up: 4 Aces are placed on 4 foundation piles at the beginning of the game. You must build up the foundation pile with cards of the same suit in consecutive order. 5) Match Suits: This solitaire game requires you to remove cards from the board by matching two cards of the same suit. Those cards must be located in the same row or column. 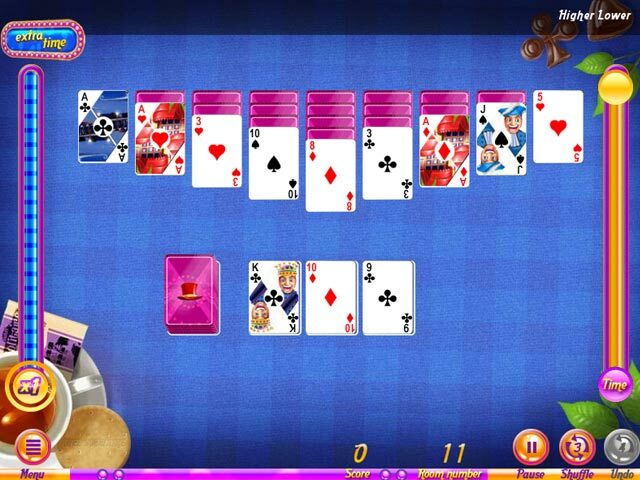 If you are looking for a variety of solitaire games, look no further and enjoy! Rated 4 out of 5 by LPERM from Fun but bad visuals I enjoy the game, I even bought it, but the cards are difficult to distinguish from on another and they move the working piles with every game, I have to think twice which cards are the board and which ones are the playables. If not for this I would have 5 starred it. Rated 4 out of 5 by nelliebj from A fun hotel stay I'm enjoying this and know it will be a keeper. Enough variety to keep your interest. The music is awful but that's easy enough to turn off. The elevator operator is a little creepy looking but you don't see much of him. Whew! All in all, it's fun and I recommend it. Rated 4 out of 5 by margot01 from I wish they made new games like this oldie Although I agree with some reviewers that the graphics are childish and the music has to be muted, I think this is a very good game because of the different kinds of solitaire. It starts easy, but gets more challenging along the way. It is an old game, but I was very pleased they dug it up!